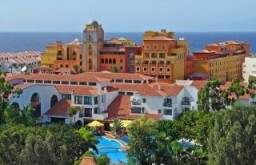 This resort is a really fine example of how beautiful a stay in Tenerife can be if you find the right hotel- and this hotel is definitely the right one. The entire complex is surrounded by beautiful palm trees and subtropical plants to make the whole place a veritable wonderland of island beauty. When you swim in the pool or relax by the sun terrace you’ll be breath taken by the stunning surroundings and will hardly want to leave the complex and go into the town. However, if you do, you can enjoy all the nearby shops and entertainment complexes that are in the nearby playa de las Americas centre and have a really great day out shopping or exploring. You could even rent a bike from the hotel to go on a cycling trip around the area. Your room has all the mod-cons and you have a separate living room and bathroom area from your bedroom plus a satellite TV connection. On an evening there is lots of entertainment on offer for adults and kids alike and there’s even a games room and tennis court for activities during the day. Perfect for families or young couples who want a fun filled holiday in a beautiful area. It’s a truly romantic setting as well.